To return to this page - Click on your "Back" button or "Arrow"
This would also include field worksites where the SDS information may be in a pickup truck that is NOT LOCKED. 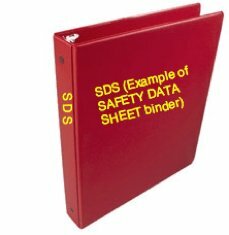 SDS INFORMATION may be in any language and ALL workers must be able to understand them. SDS INFORMATION may be on a computer as long as ALL workers know how to access this information on the computer. The downside to a computerized SDS system is that an emergency incident may cause a power outage at the critical time when the SDS information is needed. 2015 SDS - No expiry - Valid until a "substantial" change to the controlled product information occurs. Understand there are thousands of controlled products that require and have SDS's. SECTION 13++++ DISPOSAL CONSIDERATIONS (Methods) ++++ (12, 13, 14, 15) These sections must have the headings listed however Canadian regulations give the supplier the option to NOT provide information.